Legends of fairies have been around for years, but what exactly are they? The word itself is a combination of Middle English and French spelling; however there are other cultures that have legends of these creatures under different names. In England, it became the word "faie" and had the suffix "erie" or "ry" added to it... and came to mean otherworldly creatures that performed specific tasks. It has diversified meanings, anything from being extremely helpful (such as the "brownie" or the "sprite" which would come into homes and clean or otherwise assist while the residents were asleep) or having evil connotations, mainly from Christian propaganda. They are represented in many forms, from child-like winged creatures, to imposing, larger than life elementals of nature. In Ancient Rome, they were called "fata", meaning one of the Fates of Roman mythologies. In Greek mythology, they were part of the Moirai, which was essentially the same thing. These creatures decided the fate of people. In Ireland, legends speak of another race... the Tuatha De Dannan, which were thought to be the "people of the gods". The four elements of earth, air, water and fire are thought by some to be where faeries originate. By this belief, they are not only creatures meant to help... they are essential to the balance of these origins. With all of the legends circulating about these mysterious creatures, it begs the question... is there any grain of truth to it all? 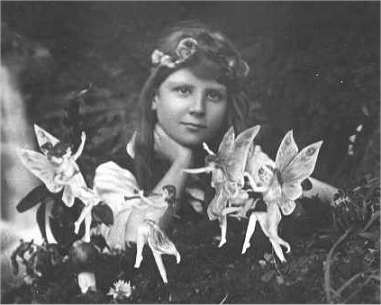 Supposed documentation of fairies came about in the early 1900's with the Cottingly case. Two cousins claimed to have caught several photographs of themselves with almost storybook-like images of what appeared to be faeries in Cottingly, England. They even captured the interest of Sir Arthur Conan Doyle, author of the famous Sherlock Holmes stories. Technology and the later confession of Frances Griffiths, one of the cousins in 1983 indicated the photos are clever fakes. Many legends and myths have some basis in history... it is thought that what are believed to have been gods and goddesses of ancient times may have actually been great leaders deified as such. Are the ancient mounds in the sprawling countryside of Ireland actually where the Aoi Si were forced underground after so many invasions? It is thought that when they went to live within the confines of the mounds that they entered a dimension outside of our own... a dimension running parallel with ours. If not immortal, maybe these mound dwellers lived there underground until they perished.